Famous for it’s early settlers and intriguing historical background, Pictou County was by the early 1900s, one of the busiest and most prosperous, commercial and industrial hubs in Nova Scotia. 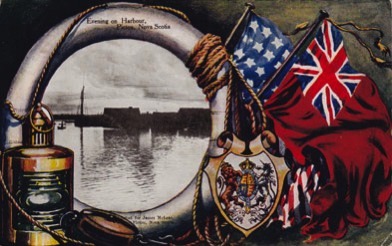 Many of the residents of Pictou County had family and friends in other areas of Canada and the USA and they kept in touch with letters and postcards. 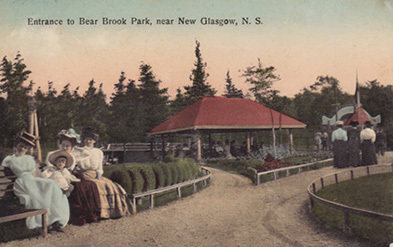 This website showcases the postcards that were sold in the shops and hotels throughout Pictou County, during the Edwardian Era (about 1900 to 1919) but also during the 20 year period after that. The Pictou County Postcard Collection originally focused on the postcards that were published and sold by the Torry family, but it has morphed into a collection that now includes cards from other Pictou County publishers. James Torey was my great grandfather and he and his brothers owned and operated Torry's Book Store on Provost Street in New Glasgow, along with other commercial interests in Cape Breton. They loved photography, and used many of their own photos, along with those of their friends, to publish many of their postcards of the area. In the early 1900s, the postcard was the equivalent of today's email or text message and friends and family could be quickly notified of events, upcoming visits, a person’s health, or you could just check on how things were going. Postcards typically had an attractive picture on the front with an area for the address and a message on the back, and they cost a mere penny to mail. Postal service was far better than it is today and a postcard would routinely arrive at places several hundred miles away within a 24 hours or less. Canada Post should take note! If you would like to use any of the postcard images or the family photos found on this site, for personal use or for any other reason, i.e in another website, in a family tree to be published online, in a book or other publication, etc., please contact me for permission, stating the reason for your request, identify where the image will be used or published, and credit this website http:// pictoupostcards.com as the image source in printed or published materials or on other websites. Please note that some of photos on this site do belong to other people and these images have been used with their permission as noted. Images supplied by others may not be used without the owners permission. If you wish to use these images, you need to contact the owner of the image to request permission for usage. I will be happy to assist with this if I can. I would love to to hear from family and friends of the Torry family, as well the other families that were involved in photography and postcard publishing in Pictou County, such as the as the Crockett, McLean, Reid, White, and Waldren families. Comments, contributions, suggestions would be appreciated. Enjoy your visit!